Liverpool take on Leicester City at Anfield today, in front of 54,000 odd people thanks to the opening of the New Main Stand. Paul Joyce of the Express, about as trusted a source as you get when it comes to our football club, has confirmed that expanding the Annie Road End is already in the pipeline. “FSG benefited from a change of attitude at the council, but have duly delivered on their promise to revamp Anfield and outline planning permission for phase two, a redevelopment of the Anfield Road End which would see the capacity exceed 60,000, is already agreed,” he said. 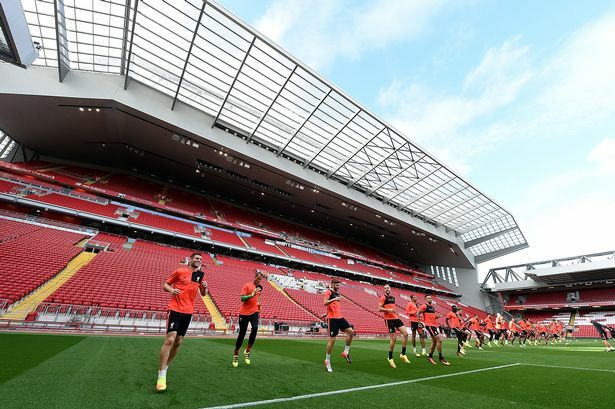 Once Anfield is 60,000 capacity plus, we should overtake West Ham (60,000) and Arsenal (60,432) in terms of Premier League capacities, and will only be behind Manchester United’s Old Trafford (76,100). Our chances of consistent success, long-term, will only be benefited by this kind of thinking. Football is growing, and we need to as well. For years we were behind commercially, but the club has well and truly caught up in that regard now and a bigger Anfield is the fan’s physical reward. Let’s hope the team start putting some trophies in the cabinet as well!